The magazine Vogue, published by Condé Nast, was the preeminent disseminator of high-class fashion to the public from the early 20th Century. 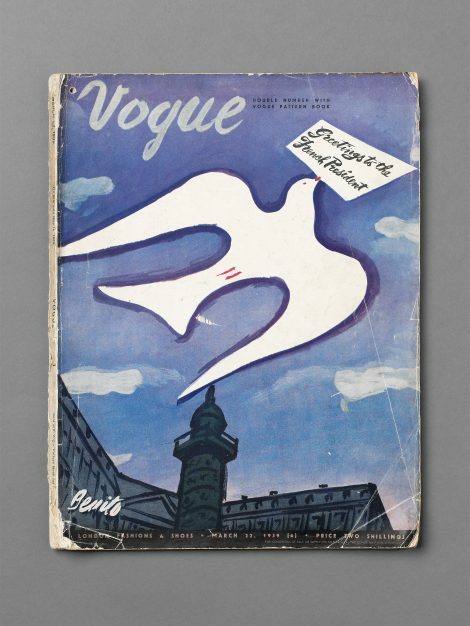 Recognising that a magazine was sold by its cover, Condé Nast employed talented graphic artists and, later, photographers to produce stylish and witty covers reflecting the artistic trends of the day. Adventurous in their composition and colouring, these covers often incorporated humour in the form of visual puns, of which the masthead was a part, – a far cry from the formulaic shots of celebrities and supermodels today. 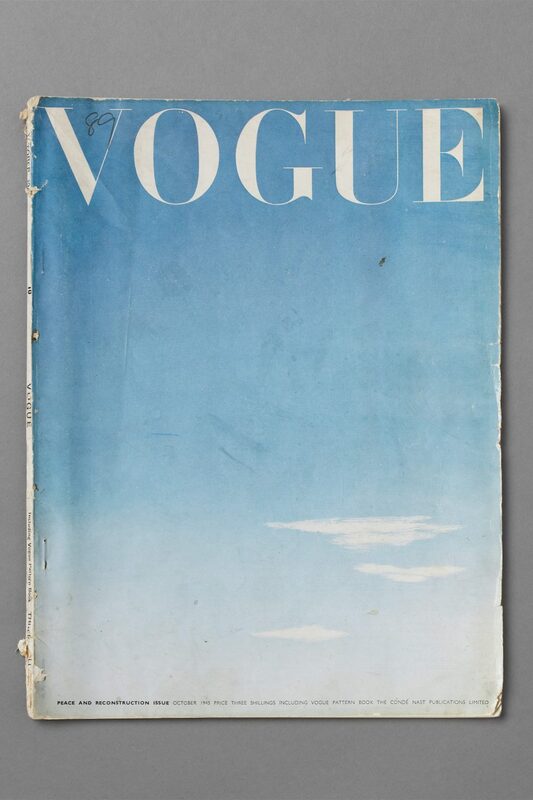 It is said that VJ Day, marking the end of the Second World War, took Vogue by surprise, and not having sufficient time to commission a special celebratory cover for its Peace and Reconstruction issue, its art director James de Holden-Stone came up with this moving image of a blue sky clear of the military aircraft that symbolised war. Despite its reputation for sophisticated and witty covers, Vogue was also a master of understatement in the representation of the mood of the nation. The death of King George V in 1936 was marked by a purple cover, absolutely plain but for its masthead, the date and the price, which was used again at the death of George VI in 1952. 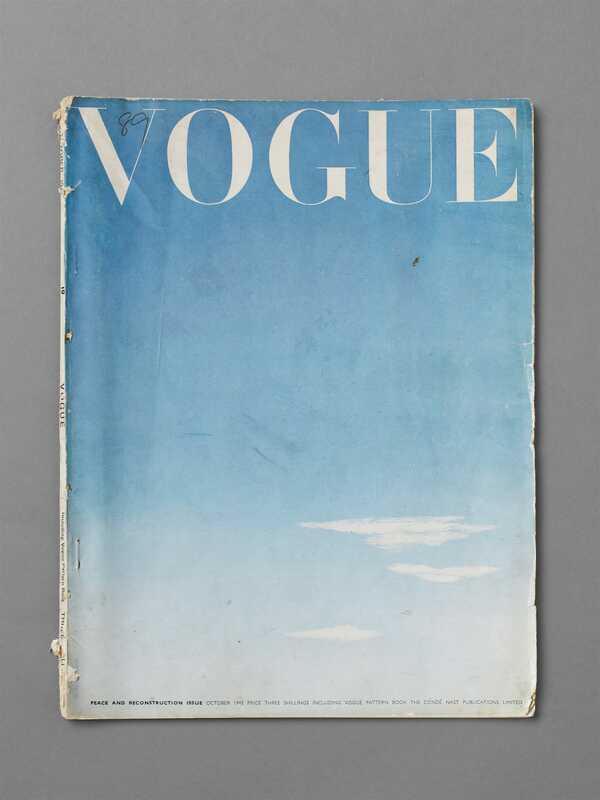 This copy of Vogue is noticeably smaller in size than that of March 1939 (see ‘Related Items’), economising on paper during the war. It did not return to its original size after the war.